Wichita State has a totally different look this season, but the Shockers are still dangerous. For four years, Fred VanVleet and Ron Baker were mainstays at Wichita State, which under head coach Gregg Marshall has become a mid-major power over the last several years. VanVleet and Baker went from being role players on a Final Four team as freshmen to having simultaneous breakout sophomore seasons on a 35–1 squad, to leading a Sweet 16 trip as juniors and coming back as seniors to help cement a legacy that included a 121–24 career record with the Shockers. Any time a team loses a talented, longtime duo like that, it calls for a major adjustment. Wichita State didn’t just lose the Baker-VanVleet pairing, either. It also lost forward Anton Grady, a transfer who ended his career in Wichita and was the team’s third-leading scorer and second-leading rebounder. That left sophomore forward Markis McDuffie as the only returning player to average more than seven points a game (7.4)—in short, it was clear that this year’s Shockers team would look very different. Enter JUCO All-America Darral Willis Jr., a 6' 9" forward who’s leading Wichita State in scoring (12.1 ppg) and rebounding (6.1 rpg), all in less than 20 minutes per game. After a somewhat slow start to the year, Willis Jr. has started to turn it on of late, including two 20-and-10 games in December. He’s joined in double-figure scoring by McDuffie and Landry Shamet, the latter of whom played just three games as a freshman last season before a foot injury cost him the year. Daishon Smith and former Kansas transfer Conner Frankamp have taken over for VanVleet at point guard, combining to produce more than 13 points and five assists per game. Like last year, the Shockers take advantage of depth and a full rotation, ranking third in the country in bench minutes. No one on the roster averages more than 25 minutes per game. Nevertheless, how good Wichita State is this year is still something of a mystery. The Shockers are 14–3, but their best win to date is a three-point victory over unranked Oklahoma, losers of six straight. They’ve had a few chances at grabbing a top-50 win—against Louisville, Michigan State and Oklahoma State—and have come up empty each time. Still, they’re ranked 23rd in the country on kenpom.com, where they fare well statistically in almost every major category. Without Baker and VanVleet anchoring it, the defense is not what it was last season—when it was best in the nation in adjusted efficiency—but it’s still solid, and the offense so far has improved from last year. The Shockers’ RPI ranking—No. 95—is a little less flattering. But they’ll have a chance to boost that ranking with a a quality win Saturday, when they take on Illinois State on the road—the Redbirds may not be a household name, but they rank 51st on kenpom.com and 46th in RPI and look like they could be real contenders in the Missouri Valley Conference. That game should give us a better idea of exactly what this Wichita State team is—one that can get to its sixth straight NCAA tournament and continue its four-year streak of notching at least one win there? Or one that may end up viewing this season as a bridge to 2017–18, when it’s currently set to return all of its major contributors? There’s no safety net for the Shockers this time around—last year, they were able to squeak into the Big Dance despite falling to Northern Iowa in the MVC semifinals thanks to a tough nonconference schedule and the fact that injuries drove their early season struggles. There will be no squeaking in this year; it’s MVC tournament championship or bust when it comes to Wichita State’s NCAA hopes. The college hoops world has grown accustomed to seeing Marshall and the Shockers on the big stage in March. Will that continue in 2017? The first of two highly anticipated regular-season battles between the best teams in the West Coast Conference, Saturday’s top-25 matchup between the Gaels and Bulldogs has been circled on fans’ calendars for months. Saint Mary’s is likely the biggest obstacle standing between Gonzaga and an undefeated regular season, and the Zags’ toughest opponent since an early December clash with Arizona. The Bulldogs have the advantage of this one being at home, but Saint Mary’s is the last road opponent to have left the McCarthey Athletic Center with a victory. After getting swept in the regular-season series a season ago, Gonzaga got its revenge in the WCC final, dashing the Gaels’ NCAA tournament dreams. Now Saint Mary’s has a chance at some revenge of its own, with an opportunity to end the perfect record of one of just two remaining unbeaten teams in the country—not to mention grab a top-five win and control of the conference. 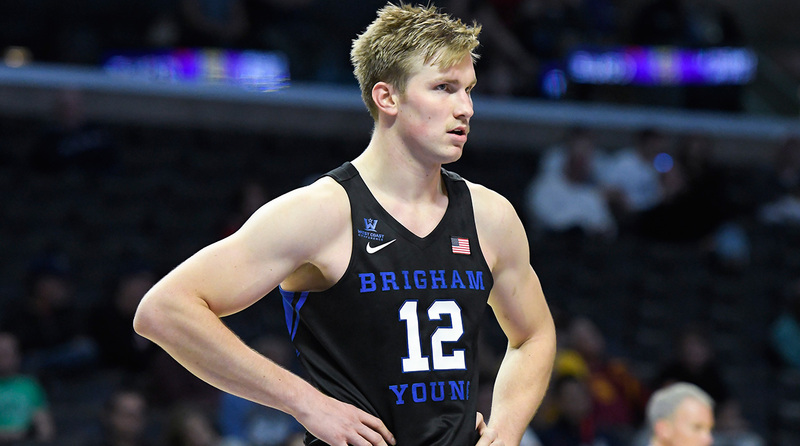 BYU probably doesn’t have quite enough firepower to seriously challenge Gonzaga and Saint Mary’s for the WCC title, but if it does make noise, it will likely be due to the play of Eric Mika, a former top-30 recruit who had a strong freshman season in 2013–14 before stepping away from college basketball for two years to serve on his mission. Hoop Thoughts: What is happening to home court advantage? Having returned to the Cougars after completing his mission in Italy, Mika is now starring as a sophomore. The 6' 10" big man is averaging 20.5 points and 9.1 rebounds per game on 54.6% shooting, and adding 1.6 assists and 1.6 blocks. He was just one rebound short of currently being on a six-game double-double streak, and notched 28 points and 10 rebounds in a recent loss to the Gaels. Mika’s biggest strength, however, may be being adept at drawing fouls. He’s averaging 9.3 fouls drawn per 40 minutes, a mark bested only by Michigan State’s Nick Ward and Nicholls State’s DeAndre Harris. And after being shaky at the line (61.7%) as a freshman, Mika has improved his free-throw shooting significantly this season (76.7%), making himself a true weapon with his ability to get to the line. A force in the paint, he crashes the offensive boards and can dish it out as well, and it has all culminated in a breakout season so far. Belmont senior forward Nick Smith entered last week having never made more than six three-pointers in one game over his 107-game career. That changed in the Bruins’ Jan. 5 win over UT-Martin, when Smith did his best Steph Curry imitation and drained 10 threes . . . in just 19 minutes of game action, and on 13 attempts. He finished with a tidy 30 points, having not even attempted a two-pointer, and topped his previous career-high by 12.